A huge thanks to Claire Parker (nee Shepperson) who contacted us from Australia with a lovely email containing these three fantastic photos of Oxton from the 1940’s, and another set from a very sunny 1985! I read that you were interested in old Oxton photos. I came across these just the other day and thought you might be interested in them. The first is Oxton School, this photo was taken around about 1942 at a guess. It was certainly during WW2 as the classroom windows are taped up. Mr Fenton on the left. 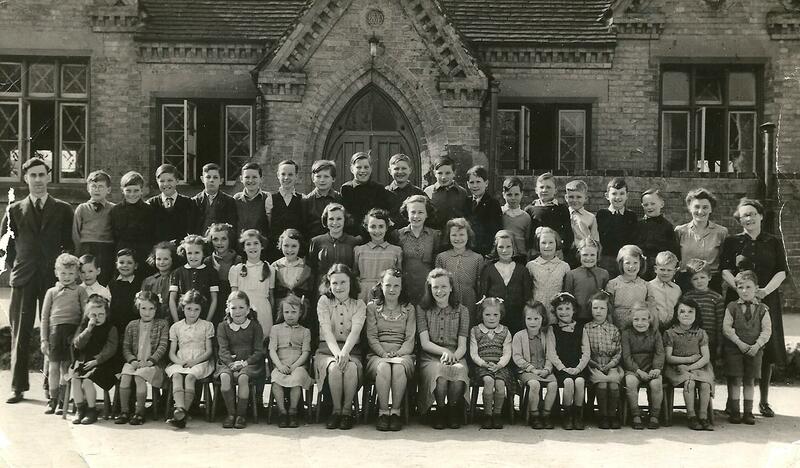 Right in the middle in the second row (in between the two slightly taller girls) is my Aunty Clare Craig, she would have been about 10 at a guess as she was born in 1932. Unfortunately I can’t name any of the other children in the photo. Mr Fenton taught all of the eight Craig children, including my mother Kathleen. And he taught me too. I have very fond memories of him. 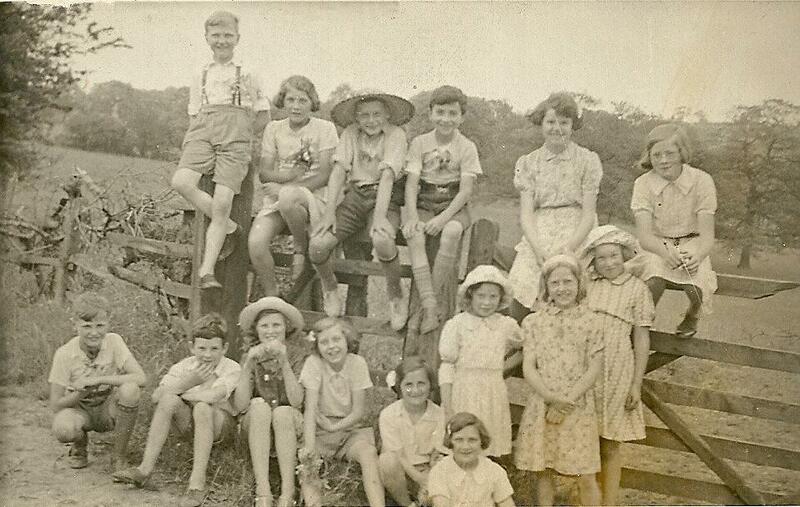 The second photo has written on the back ‘Pilgrim Club’ 1941. My Uncle Rowland Craig is back row fourth from left and sitting on the gate post. Again I can’t name any of the others. The third photo is at a guess some kind of Chapel picnic. My Grandad, Franklin Craig, is sitting on the fence. 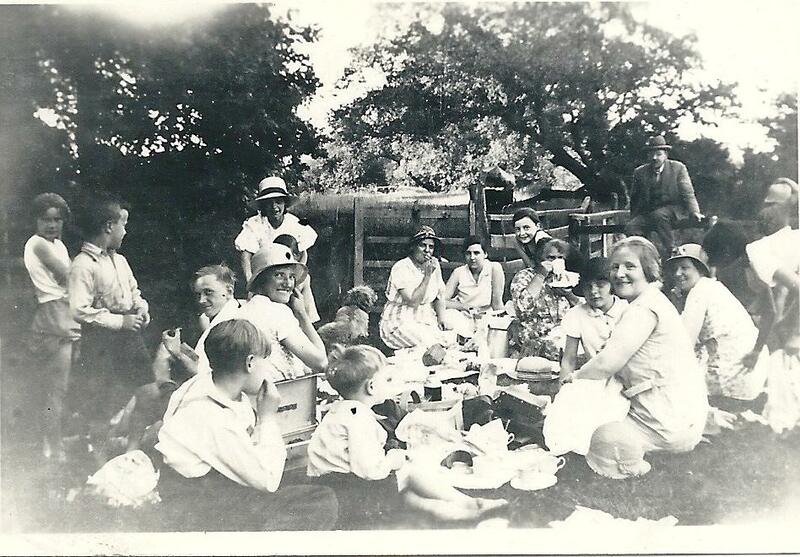 My Grandma Ethel Craig (nee Green) is sitting at the back in the middle about to take a bite of some food, next to her and to her left is my Aunty Sylvia Craig and to the left of her crouched down with just her head visible is my mother Kathleen Craig. Can’t name any of the others. I also found some photo’s of Oxton taken in 1985 which I’m more than happy for you to share. By the way, I love your website. It’s a way of keeping in touch with my roots, I often miss my childhood days in Oxton. If you can identify any of the people in the photos, please get in touch! We are always on the lookout for old and new photos of Oxton to add to the collection, and very much welcome all contributions.